This morning I woke to more depressing news of what most reliable journalistic sources say is the barometer of the world -- Greece. 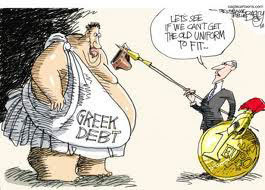 According to an article in the New York Times, titled The Way Greeks Live Now, things are unraveling at a rapid rate. (I know, I know.... the New York Times? But the fact that they didn't sugarcoat reality piqued my curiosity). As I read the article, it was unnerving; a Greek reporter was expounding upon the state of his country ....."the insidious ways in which the upper echelons of Greek media were intertwined with the political structure, which prevented reporting of financial mismanagement, and also clouded any hope for resolving the crisis." Substitute US media for Greek media, and could you tell the difference? The reporter goes on to describe the average Greek's existence -- it seems everyone talks incessantly about the economy, but everyday life goes on; the citizens in a trance. One-fourth of all Greek companies have gone out of business since 2009, and half of all small businesses can't meet payroll. The saddest statistic was this: the suicide rate increased by 40 percent in the first half of 2011. He goes on. A barter system has evolved as people try to figure how out to survive when their economy is so broken. The article goes on to say that people are hiding money under their mattresses because they don't trust their banks; decently dressed Greeks are discreetly rummaging through garbage bins for food; and a new book about how the country survived the Nazi occupation, titled Starvation Recipes, has become a popular hit. There was a poignant, almost comic relief, to the article. A Greek couple who admitted that "the Greek way of life is to spend and then overspend", admitted that austerity cuts were necessary. They had lived for a short time in America and then returned to their homeland, only to find it much more difficult to live than they expected. But they have an escape plan. They became American citizens while living in the U.S. And when the husband turns 62 in two years, they plan to come to America and apply for Social Security benefits! As the government adds new taxes upon new taxes, the Greek population handles it the only way they can -- they protest and evade. But protests lead to ugly confrontations and businesses are burned, as the young, who are heavily unemployed, act out in anger. The older Greeks, choose to evade the oppressive taxes by ignoring them. Toll plazas are erected along busy thoroughfares, and the citizens just lift the toll arm, amid bells and alarms, and drive off. When an additional income tax was passed in 2010, (in effect, retaxing that year's income) the populace refused to pay, so the government added a new property tax to their electric bills, which you could evade only by having your power cut off. The solution? Return to the mentality of their ancestors, the Spartans. Get mean and lean and smart! Quit borrowing money and spending unwisely. Sound familiar? Think we could learn a thing or two? Are you listening America? What concerns me is that too many of my fellow Americans don't see our own reality. They think it could never happen in America; we are too successful, the world relies on us, and they still have their jobs and eat out every other night, so how could things be so bad? But I challenge you. Have you noticed the rising prices at the grocery store? At the gas pumps? 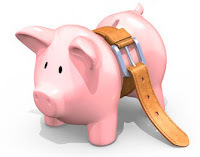 Are you out of debt, so that, heaven forbid, IF our economy falls off the cliff, could you make your mortgage payment... car payment .... kids' college tuition? Psalm 13:18 "Whoever disregards discipline comes to poverty and shame, but whoever heeds correction is honored." It is your voice that this generation needs to hear, and I am indebted to you for sharing your wisdom and your experiences. Please feel free to continue blessing this blog with your insight and discernment.